Strawberry Angel Food Cake Jars are fresh berries, cubed angel food cake, and lightly-sweetened homemade whipped cream. Each bite is Heaven! As I mentioned last week, my family is a total Strawberry Angel Food Cake family. We’ve definitely carved out parts in our hearts (graphic) for Dirt Cake, and for other warm-weather dessert occasions, but light-as-air angel food cake topped with cold whipped cream and freshly sliced strawberries is about as easy and delicious as it comes. Pure summer. Inspired by the salad in a jar I had in Monterey last week, I decided to give the classic dessert a little twist by layering it in a wide-mouthed mason jar, vs slicing and serving on a plate, and call it Because, really, when’s the last time eating something out of a jar made you less than sublimely happy – especially when homemade whipped cream is involved? These sweet treats are great for spring and summer get-togethers, especially Memorial Day, when it’s hot out and you want to end the meal with something light. Assemble the jars a few hours ahead of time or, for some real fun, make an Angel Food Cake Jar bar by laying out cubes of angel food cake, homemade whipped cream, and tons of different berry varieties so people can make their own layered concoctions. Start the Strawberry Angel Food Cake Jars with a 7″ Angel Food Cake. 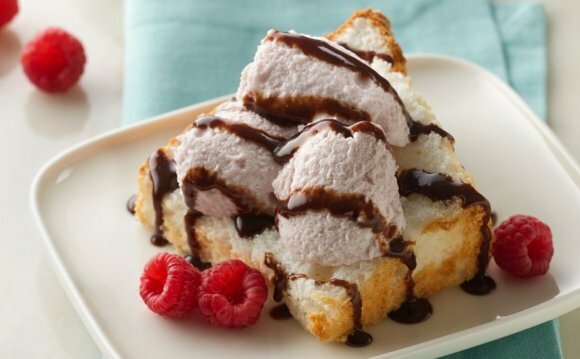 I just love Angel Food Cake as it’s basically like eating sweet and puffy cake clouds. Winning! BTW, I was 16 years old the first and last time I tried to make my own AFC. After taking what felt like an hour whipping up a million egg whites then tenderly folding in the rest of the cake ingredients, the dang thing never came out of the pan after baking. Ever since then I’ve taken a little help from the bakery section at the grocery store with no regrets.